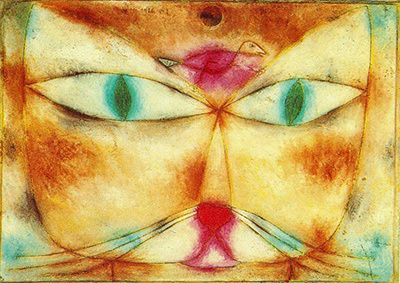 Paul Klee cannot possiby be classified, his career covered Expressionism, Cubism, Futurism, Surrealism, Abstraction and much more besides. Boldness and innovation were two of Klee's finest qualities, and these were essential ingredients to his continual development and productivity. Many have mentioned his output of around 10,000 artworks but the truly remarkable achievement was the way in which each one was different to the next, taking in multiple art movements and mediums. The one consistent element throughout his career was the importance of colour, and this was a topic about which he was to become obsessed. Whilst using oils, watercolours, charcoal and pencil drawings or even mixed media pieces, colour would always have been at the forefront of his mind. Such a breadth of work required a simiarly diverse range of influences on Klee and these would come from his travels across Europe and North Africa. His spell at the revolutionary Bauhaus would also be highly significant. Significant artists close to Paul Klee included Kandinsky, Picasso, Franz Marc and Braque. His own influence upon them would be his passion for colour and the theories which he would later publish in several volumes. Many artists have become inspired to take new artistic directions after visiting prestigious exhibitions and Klee was similar in that regard. In the early 20th century, around 1907-08, the artist would visit several exhibitions of work by Henri de Toulouse-Lautrec and Vincent van Gogh. Several years later he would view several original Paul Cezanne artworks at the Munich Secession exhibition. This was a significant time in his life, 1909, as he had recently married and would then hold his first solo exhibition the next year. 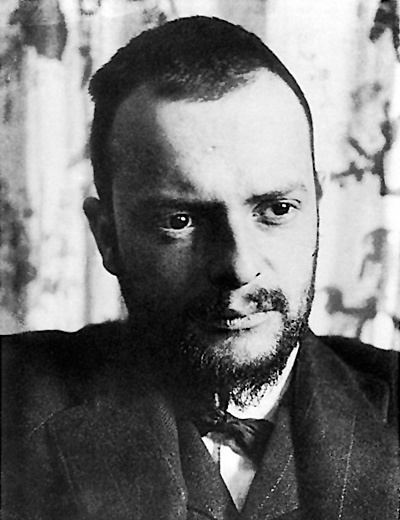 Klee once filled in a questionnaire about his artistic influences and beliefs, in which he cited Francisco de Goya and Edouard Manet as his greatest inspirations. Whilst true at that time, he would later draw in all manner of other influences to expand his repetoire yet further. It was soon after this initial exhibition that Klee was to begin cataloguing his work. This ultimately proved a great decision as by the end of his career, there were around 10,000 artworks in total. Paul Klee was to make several significant travels during his artistic development. Otto Ralfs, an art collector, had set about creating the Klee Society as a way of generating funding for these trips. Members could pay a small fee and in return would enjoy discounted artworks from their revered artist. In December, 1928 he would set upon a trip to Egypt, somewhere he had long since wanted to visit. He was relatively unproductive in terms of output - just a few sketches, but his real discovery was through studying at close hand the history of this ancient culture, specifically in Giza, Luxor and Karnak. Klee would later create work from his experiences here once he had arrived home, though it must be said that he didn't get quite the same enjoyment as from his earlier time in Tunisia. It was around his 50th birthday that the artist finally could be seen as truly international and respected by academics across Europe in particular. It was at this time that exhibitions were held of his work in Dresden, Berlin and Paris. There was also an exhibition at MoMa in New York, the first by a living European artist at that time. Klee was then to take up a teaching role at the Dusseldorf Academy of Fine Arts but was later to be removed because of his refusal to discipline students of communists leanings. At a time of political turbulence in Germany, left-leaning academics were not seen as suitable. Whilst continuing his desire to teach younger art students, Klee would start to become frustrated by the relatively conservative approach of many of those in that age group. At this stage he was also continuing his work from a studio in Dessau, ensuring he was always busy even with an undersubscribed art tutorship. It has already been mentioned here about how Klee was inspired and influenced by the work of these two modern masters. Yet, they were also to spend time together rather than just appreciate each other's work from afar. It was in Paris that he would meet both Kandinsky and Picasso, seperately, with the latter as a result of signing with a connected art dealer, Kahnweiler. Kandinsky himself had met Klee as early as 1911 and the three had become true leaders of European Modern art by this stage. Klee and Kandinsky had both taught at the Bauhaus and also shared a passion for the theories around colour. They would also move together, along with their families, when political issues forced the Bauhaus to move cities. Their close ties continued after that and this was a friendship where art was paramount, but not the only connecting factor. At a time when artists with contemporary styles were struggling to obtain backing, those who were already involved would naturally stick together and form close bonds. Paul Klee was a Swiss artist from the Expressionist, Bauhaus and Surrealist art movements and his most popular artworks were often highly dependent on his colour selection. His style was primarily abstract, but experts are yet to classify it since it contained elements of children’s art, surrealism and cubism. He was a transcendentalist who held the opinion that the material world as one of the numerous realities perceived by human awareness. To offer views of that philosophical principal, Klee used colour, design, pattern and miniature design systems. Paul played the violin throughout his life, and many times, he practised as a warm-up for painting. He drew analogies between the two arts, such as in the time-based painting process and the transient nature of a musical performance. His work went beyond traditional boundaries as he explored modern, largely abstract and expressive poetic language that featured pictorial signs and symbols. This fact is evident in features like musical notation, arrows, lines, ancient hieroglyphs and letters that frequently appeared in his paintings. Klee was a great admirer of the art of children due to its untutored simplicity, which he used in his work. The intense colour used is an example, and it is an idea he got after a tour to North Africa. There are several instances that he went against the conventional rules of painting in oils on canvas. He also sprayed and stamped paint, which was unusual at his time. With over 10,000 pieces of paintings to his name, Paul Klee was, undoubtedly, one of the most productive artists to have ever lived. The Swiss-German artist was born on 18 December 1879 and his other talent, playing the violin, was apparent early on. However, Klee chose to perfect his drawing skills by attending the Munich Art Academy, an unusual move since he was born in a musical family. His tutors at the art school included Franz von Stuck, who was a society painter and popular symbolist. The greatest inspiration to pursue a career in art came during Klee’s Italy tour where he responded to Early Byzantine and Christian art enthusiastically. Paul Klee paintings are key elements in the rise of modern art and his career included several different styles from the new 20th century art movements which Paul Klee helped to develop. The artist also produced thousands of drawings and etchings as well. This was a Swiss German modern artist who came to prominence in the early 20th century at a time when there was great development occuring within the European art scene which was to continue to attract new ideas that contrasted to traditional thinking which was starting to look old-fashioned and out of touch with modern society. The artist's paintings have been classified within several different related movements including expressionism, cubism, and surrealism. A spell in Tunisia was also significant in his development. You will see from the photos of his work that this artist offered a skillful approach to colour and this was the main skill of the artist, who went to the extreme lengths of researching and publishing papers on the theory of colour. Several of his abstract works rely almost entirely on his colour selections and these are amongst his most popular paintings. The nature of abstract art means that with little detail there is a huge importance laid in the use of colour combinations. 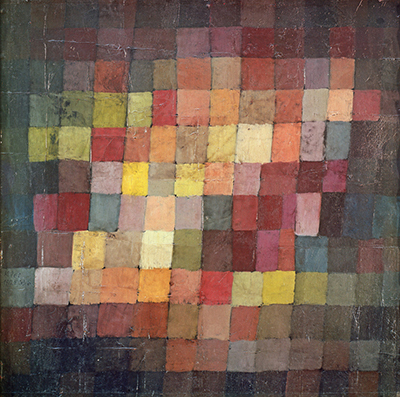 Paul Klee was an incredibly proilific artist who created over 10,000 art works over his 40-year career, which is more than almost any other artist in history. Within this you will find watercolours, oil paintings, drawings, hand puppets and much more besides. Amongst his media were the oil paintings as mentioned here, plus also large numbers of drawings and etchings which have also since attracted interest for those looking into his career in more detail than they had previously done. Paul Klee received his training from the Academy of Fine Arts, Munich and went onto to feature in the art movements of Expressionism, Bauhaus and Surrealism. The Zentrum Paul Klee now hosts much of his work. Much of his theoretical studies were released in his notebook series. www.Paul-Klee.org covers all of his finest paintings from a long and distinguished career and also offers inciteful information on the life of the artist himself whose legacy remains strong even today. Castle and Sun is a charming cityscape Paul Klee painting that creatively depicts a cartoon-like castle with sun sitting above in a truly abstract matrix of coloured squares which at first makes it unclear as to quite what it is. As you consider the title of the painting, it quickly becomes clear and further details of the castle become apparent after each and every viewing, making this a very intriguing cityscape. The bright colours used have also ensured it to be a popular choice as reproduction. 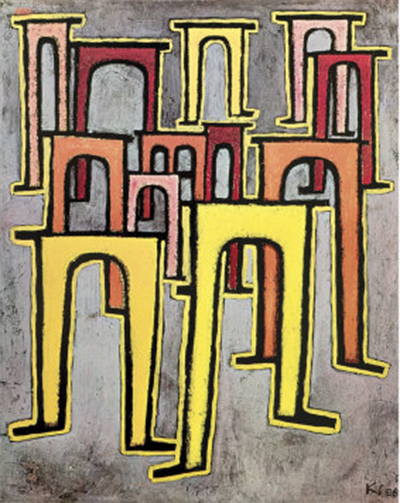 Klee roduced multiple cityscapes during his career, some in this abstract, brightly oiled approach. He would also produce many abstract watercolour scenes from his time in Tunisia. It was the simplicity of buildings that fed his abstract work, with squares and triangles being sufficient to portray most items in his scenes. You will see from Senecio, too, how he would continue this technique into portraits. Senecio is another highly abstract work with some similarity to the cubist movement which included the likes of Pablo Picasso. Senecio features the head of an old man in another bright piece that relies on oranges and reds to deliver a warm painting, which has become on of the artist's most popular in recent years with many choosing as a reproduction for their own homes, probably because of the positive outlook that comes from such warm colours. 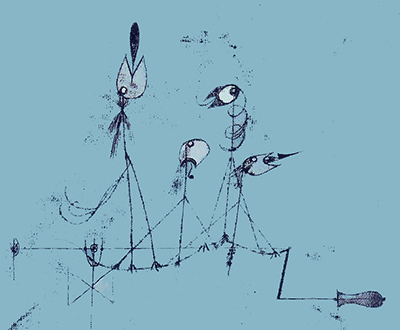 New Angel (Angelus Novus) is amongt Klee's most famous sketches. It is a significant work in that it expresses many of Klee's turbulent feelings during a difficult time in his life. This artwork is purely expressionist, one of many art movements touched on by Klee during his truly diverse career. The monoprint technique used by Klee here was truly original and something many others would later take into their own work. 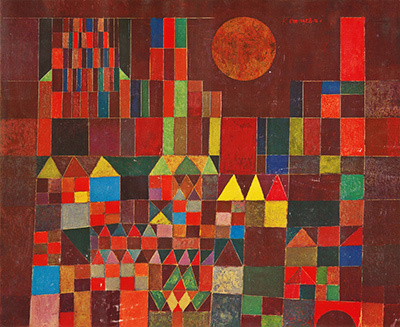 This technique continues into several other famous Klee artworks. They can be found in the paintings and drawings sections of this website. 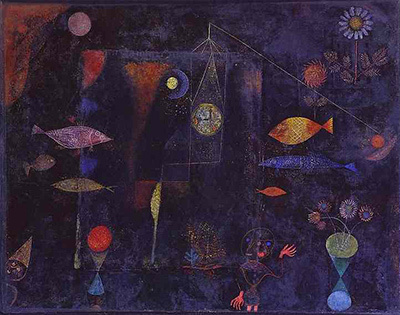 Fish Magic is another interesting piece which lures the viewer in with bright colours set against a dark background that can be seen in several of Paul Klee's most famous paintings. 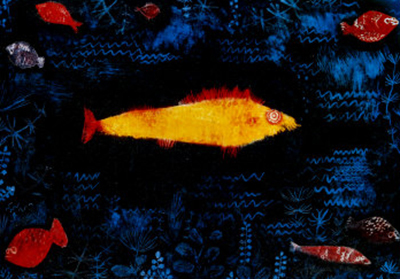 Within Fish Magic there is a relaxing scene that actually reflects a real deep sea scene and the artist carefully offers a wide array of different oranges, reds, greens and blues to cover the beautiful different fishes and plants found in the painting. Disclaimer: www.Paul-Klee.org is a personal website covering the career of Paul Klee, but is in no way an official website for Paul Klee and www.Paul-Klee.org does not claim to be that in any way. The Estate of Paul Klee and their presence hold all necessary copyrights and licences for all of his paintings and other works. 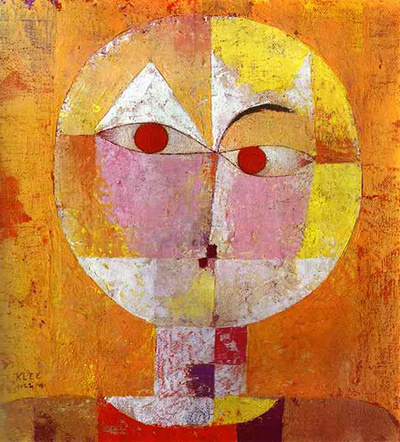 All prints, paintings and photos included in www.Paul-Klee.org are provided as an affiliate to Art.com who hold necessary permissions. Art.com pay us small commissions based on any prints or paintings that you buy as a result of using this website.